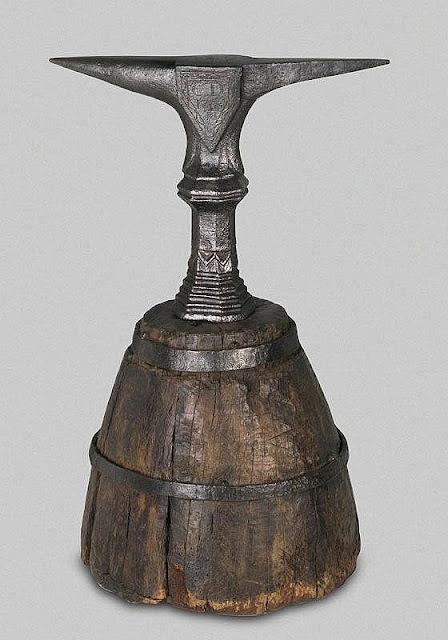 (1) Form of bellows for spreading seed or fertiliser. (2)Blacksmith's tool catalogue. 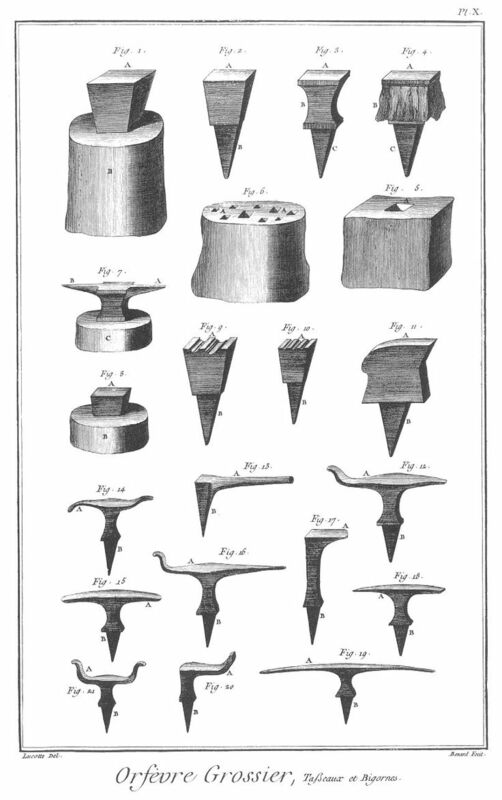 Most of the tools illustrated for slotting into anvils. French, late eighteenth/early 19th century. (3)Adjustable handle for turning large drill bit. Early twentieth century. (4)Half size anvil. Appears to bear a date around 1750, but the decoration would indicate a rather earlier date. Possibly an armourer's anvil. 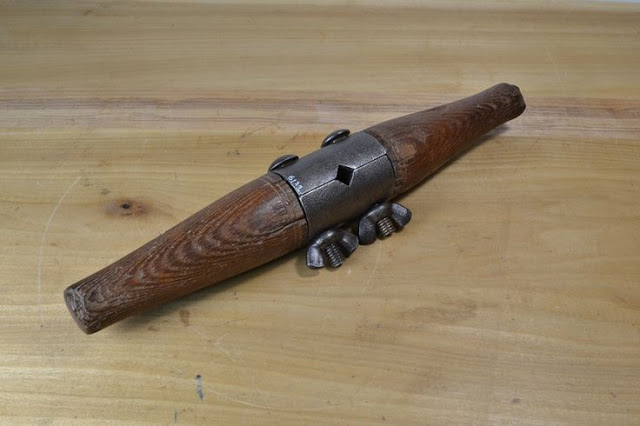 (5) A ceramic hand grenade. Late medieval. Probably Eastern European. 5. 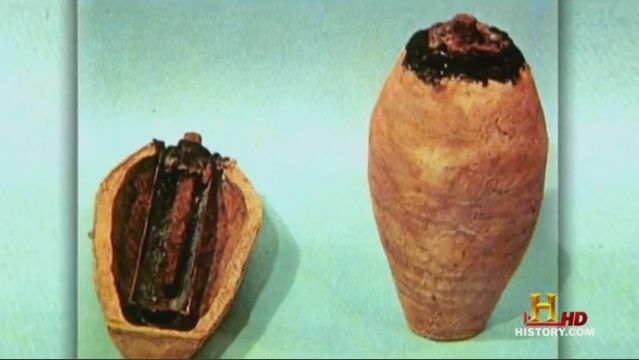 I believe what we used to call a "Baghdad Battery"
Impressive gentlemen, very impressive. Number 1. goes to Rog, this planter was specifically for corn planting, you worked sideways along the field, Inserting the device into the soil causing the lower spring to push the perforated seed-board across and release a few seeds into the funnel. Lifting the device allowed the upper spring to return the seed-board ready for the next stroke. Hard work but not much slower than broadcast sewing and much more economical on seed as well as preventing birds eating the deeply set seeds. The foot of the lower spring would compress the earth above the previously set seeds. 2. I think Mike was a tad closer as the object is a page of a catalogue, but Rog was more specific as he knew the correct trade, goldsmithing rather than blacksmithing. 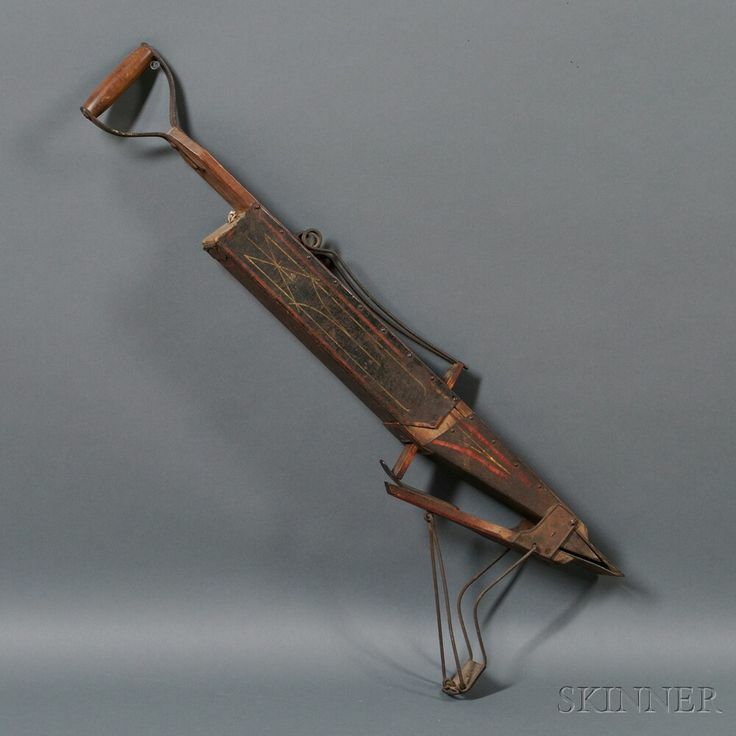 No.3. very close again gents, but Rog has the edge, it is indeed and auger handle (although I know of square-drive drills that could be inserted into such a device. 4. Alas Rog your uproarious sense of fun has led you astray, I think Mike's answer is the more likely. 5. Spot on Rog, they are called that, and some otherwise clever folk believe the Babylonians had developed the voltaic cell, long before Monsieur le Clanché. But I am tempted to think Mike might just be right too. A late mediaeval grenade could well have been lost among those ruins and recovered by bemused archeologists, that is a more credible scenario to me. May I suggest pistols at dawn? or perhaps you would care to duke it out or draw straws to determine the winner?